Hotel Holiday Siófok was built and opened in 2001. For our guest pleasure our Hotel is situated on the Siófok Beach on Petőfi Sétány form 6-8 minutes walk from the town centre. We are awaiting our kind Guests with 30 double room each with supplementary bead and communicating rooms on demand. Every room is equipped with bathroom, television and balcony with a view to the Lake Balaton. The Hotel is next to the beach. Guests with car may resort the parking area in front of the Hotel free of charge. The Restaurant offers delicate Italian and Greek meals and the Internet Coffee serves exquisite cocktails for the surfers. Sport lovers have the opportunity for playing tennis and may enjoy the daily programmes of Beach House (aerobic, beach volleyball, water polo, water football, water volleyball). Visitors during spring and fall may have a pleasant relaxation. The sight of the sailing boats, swans and wild ducks draw a pleasant picture. In summertime numerous events, concerts and many other entertainment possibilities are available for the visiting Guests. One of the biggest benefits of our Hotel that it is situated straight next to the Lake what makes bathing as comfortable as possible. Every room is equipped with television, bathroom with shower and a balcony with a view to the Lake. Each room is a double room with an extra bed on demand. For the families we can provide communicating rooms. These rooms have inner-side door in a way we can accommodate two adult and two children (six person maximum). The Hotel is situated on the Siófok Beach, where Guest can resort the services of paddleboats, sailing and bungee jumping. Children can enjoy the occasionally shallow water with sand pits and the several playgrounds. In this way the whole family including the smallest and the adults might find a suitable pleasure. Our abundant breakfast buffet fulfils all requirements. During July and August Coca-Cola Beach House is awaiting the Visitors with every time better events serving refreshments. Aerobic, water- and beach football, beach volleyball, badminton, and basketball are all available for sport lovers. Free concerts, movies, fashion and cocktail shows make the entertainments more variable. 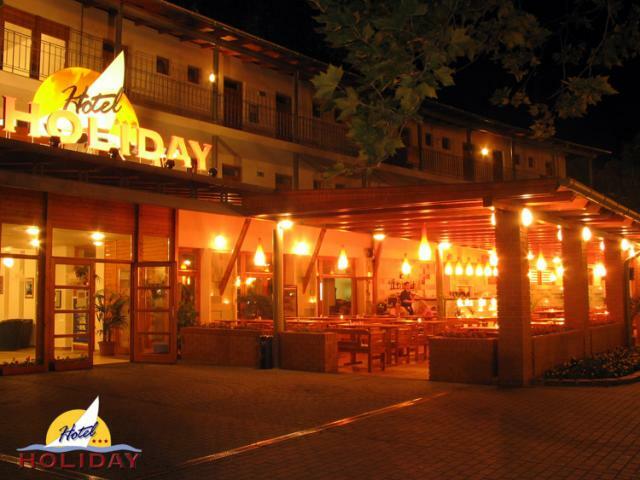 Internet café, cocktail bar, Terasz Restaurant & Pizzeria are operated in our Hotel. In our souvenir shop particular jewelleries and gifts can be found. The terminal of the sightseeing mini train – operated between Siófok Aranypart and Siófok Ezüstpart – is situated next to our Hotel. This sightseeing trip provides excellent entertainment possibility to who’d like to do something that is enjoyable for children as well - besides bathing. Dear future Guest of our, have a light walk from our Hotel and enjoy the scenery! You might walk through the re-built Festival Walkway (Fesztivál Sétány) where lot of different amusement and shopping facilities are waiting You. Then You might have a walk at the wonderful Jókai Park landscaped with secular trees and while the children playing at the new playing facilities You can have a pleasant view over the park. At the end of Your walk You can consider the departure cruise ships, sailing boats and the scene of the always different colours Lake Balaton. At the restaurant our Guests can select among particular appetizers, traditional relished soups, different kinds of Italian and Hungarian meals, excellent steaks and fishes. For the kids pleasure we serve pizzas made in brick oven. For vegetarians and lovers of fitness diet we offer suitable dishes, so as Guests follow healthy lifestyle also have numerous options. The famous Hungarian wines complete the relishes of foods. Sweet toothed Guests might taste tiramisu and other sweets. On finishing the meals we offer original Italian Perfetto café specialities and hot chocolates or the premier quality Newby teas. For the kids pleasure we serve pizzas made in brick oven. For vegetarians and lovers of fitness diet we offer suitable dishes, so as Guests follow healthy lifestyle also have numerous options. The famous Hungarian wines complete the relishes of foods. Sweet toothed Guests might taste tiramisu and other sweets. On finishing the meals we offer original Italian Perfetto café specialities and hot chocolates or the premier quality Newby teas. For our guest pleasure our Hotel is situated on the Siófok Beach on Petőfi Sétány form 6-8 minutes walk from the town centre. We are awaiting our kind Guests with 30 double room each with supplementary bead and communicating rooms on demand.